“The Federal role in education has not really ever been about curriculum or how local and state funding mechanisms are structured. It’s always been more about protecting the rights and needs of those who are not part of the center of the bell curve when it comes to their ability to access the education we are all guaranteed. The Federal role in education is mostly felt through the enforcement and funding behind things like IDEA (for children with disabilities), Title IX (for equal access), Title I (for students in poverty), and a handful of other programs. “Betsy Devos is completely ignorant of these programs and has no interest in enforcing them. If your child is poor, female, or struggling with a disability (learning or otherwise), you can expect the Federal DOE to be most notable in its absence of support. 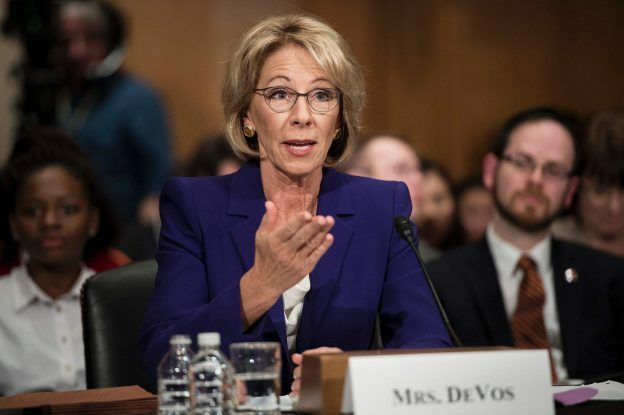 “What Betsy DeVos is most interested in are the elements of education which are actually the purview of the states and local municipalities — curriculum, instruction, and funding mechanisms. What we can expect to see is a massive federal over-reach into states’ abilities to legislate their own curriculum (including the adoption and implementation of common core), determine their own mechanisms for determining which institutions deserve funding (including efforts to legitimize religious education as a state sponsored activity), and teacher evaluations and responsibilities. “If you are for quality education, she is your worst nightmare. “If you are a fan of states’ rights, she is your worst nightmare. “If you are a fan of competence, she is your worst nightmare.